Leídas la Ilíada y la Odisea, diría que me ha hecho disfrutar un poco más la segunda, quizá por los seres fantásticos (inolvidable el duelo entre Odiseo y el cíclope Polifemo, a quien aquel deja ciego) que hacen peligrar el periplo de Odiseo (prefiero el nombre griego, por mucho que la inmensa mayoría de las traducciones en español lo llamen por el nombre latino, Ulises) de Troya a Ítaca. Los dos poemas homéricos son cantos escritos a mayor gloria del héroe griego (Aquiles en la Ilíada, Odiseo en la Odisea). Ambos son trepidantes y cruentos, pero es más bestia la Ilíada. Homero no da tregua a nadie: ni al lector, ni a los dioses ni a los mortales que lidian entre sí para obtener los favores de Zeus. Si algo merece resaltarse de estas dos obras maestras de la literatura griega es el uso retórico de epítetos sonoros y descriptivos que, al repetirse sin cesar, imprimen la cadencia de un canto: Zeus, que acumula las nubes; la ojizarca Atenea; Aquiles, de pies ligeros; la Aurora, de dedos rosados; Odiseo, fecundo en ardides; los aqueos, de hermosas grebas; el ponto, rico en peces; y un largo etcétera, pues el catálogo de dioses y mortales que pueblan estos poemas es inabarcable. De la Odisea, me emocionó hasta las lágrimas el reencuentro, al cabo de veinte años, de Odiseo y su perro. Pese al disfraz de mendigo que camufla a su amo, el viejo Argo lo reconoce y, acto seguido, muere en paz. Una escena acongojante. No se puede describir mejor la fidelidad inconmovible de un perro hacia su amo. A Homero solo se le puede achacar algún que otro error en forma de anacronismo: el más llamativo es que la acción se ubica en la Edad del Bronce, y en varios versos se alude al hierro, un metal que no se conocía en esa época. (Siento desmentir a un helenista de la talla de Carlos García Gual, que sostiene en la Introducción que en la Ilíada no se hace mención alguna al hierro: tengo la lectura de este poema muy fresca y recuerdo perfectamente, al menos, tres menciones a dicho metal, dos de ellas en referencia a armas y otra en alusión a sentimientos). Pero estos deslices no empañan la gozosa lectura de la epopeya que se narra con profusión de detalles en estas páginas.Escogí la edición de la BLU por ser la canónica y la única versión bilingüe griego-español de la obra de Homero. La Introducción es de Carlos García Gual y la traducción, impecable, de Emilio Crespo y José Manuel Pabón. Mi siguiente objetivo, como no podía ser de otro modo, es la Eneida, de Virgilio, la obra maestra de la literatura latina. The best story ever-it has everything-love, romance, war, brave, handsome men, exotic places, monsters, beautiful women-its all in these two stories. Odysseus is my all-time favorite hero, and although he is a brave hero, he has his faults and it's this combination that makes him so lovable and what makes this story one of the greatest of all time. The text can be difficult to read, and following the who's who of the gods and goddesses can be quite a feat. I've read it several times, I never get tired of it. Other than the gruesome, violent images often presented in magnificent detail (hey, it is a war! ), I really enjoy reading Homer's epic poem. Where else are we given such insight into stubborn Agamemnon, noble Hector, intelligent and well-spoken Odysseus, lazy and spineless Paris, guilt-ridden Helen, the wrath of the warrior Achille's and how vain he can be? We can identify with Trojan and Greek alike, agonizing with both sides over the destructiveness of war. We get the inside story on all the Greek and Trojan heroes and what makes them tick. And best of all, we get a behind-the-scenes, humorous look at the Greek gods; their strengths, weaknesses and all the squabbles and fuss that take place between them. The Iliad is really incomplete without The Odyssey, so I will be reading and reviewing that book as well. I had read a synopsis of the adventures of Odysseus in high school, but it was nice to read the entire epic poem to get the full story. Odysseus is an intelligent, cunning hero and you are really rooting for him by the time he finally makes it home from his long journey and is ready to take action against the usurpers of his household. So many stories of this time period end in tragedy, it's nice that there is a satisfactory end to Odysseus's story after so many years of pain and heartache for him and his family. I enjoyed The Odyssey more than The Iliad because it seems a more intimate story overall. We really come to know the man Odysseus, his son Telemachus and wife, Penelope through their thoughts and interactions with others. The Iliad takes place during the Trojan war and focuses on the Greek and Trojan warriors and what takes place on the battlefield. The Odyssey is not quite a continuation of the Iliad, but takes place 10 years after the end of the Trojan war from which the great warrior Odysseus never returned. It seems he had some trouble on the high seas and on various islands along the way and has been unable to make it home. In the meantime, his home has been invaded by suitors who think he is dead and want to marry Penelope. Telemachus is not strong or powerful enough to throw them out and goes on a journey to find news of his father. With the help of the gods, Odysseus and Telemachus are finally able to defend their home. I would recommend reading both The Iliad and Odyssey together but if you're only going to pick up one, read The Odyssey. The translation was pretty readable. This is part of the Great Books of the western world Collection that I have set out to read.Ulysses is my favorite Greek hero.Always was always will be. I read parts of some butchered version in high-school but this one seems to have satisfied my goddess needs.I think we perhaps need some revitalization of the sentiments present in these books to save America from going down the cultural tubes. When the Odyssey is replaced with the "jersey Shore" cannot possibley turn out well.How could i rate such a classic any less than 5 stars!? @مجدي كامل المنياوي صاحب هذا الكتاب سارق رسمي... ينسخ عن النت والمنتديات وويكيبيديا بالحرف...طبعا خلال 5 سنوات طبع في دار الكوبي-بيست العربي-القاهرة...وأعني ما يسمى دار الكتاب العربي ما يقارب المائة كتاب...بحسبة بسيطة فإنه يؤلف كتاب كل 18 يوم و 6 ساعات....طبعا هذا لا يعقل ولا يمر إلا على الأغبياء...فهو وفريقه مجرد مرتزقة كتب لا يقرأون حتى ما ينسخون من ويكيبيديا والمنتديات..فتجدها بنفس الأخطاء المطبعية....في معرض الكتاب في الشارقة 2013 وجدت لهم قسم كبير...من الواضح أنهم يحسنون صنعا من ناحية البزنيس....وتعرفت على الشخص الموجود وقال أنه ابن صاحب الدار....وأفرغت له ما في جعبتي من أنهم مجرد دار نشر تخدع القراء وتستغفلهم ...وقلت له أن مجدي كامل لا يسوى 5 قروش في عالم التأليف...فقال لي أن هذا غريب ﻷن الكتب تدقق مرتين قبل الطباعة...وانه يدفع فلوس جيدا لمجدي كامل ﻷن "سعره غالي"....فقط اقرأوا ماذا يقول عنكم القراء في موقع goodreads...أنتم مجرد ##### طباعين....ووعدته أن أحضر له كتاب "سقوط دولة الفيزا كارد" للسارق المدعو مجدي كامل حتى يرى بنفسه الكوبي بيست لصفحات بالعشرات من ويكيبيديا ومنتديات ومواقع إخبارية مع تكرارات مخزية لصفحات كاملة فهم لا يكلفون نفسهم قراءة ما ينسخون.....لكل زمان مرتزقته وتجاره .. It didn't take me long to figure out that I'm not a Homer girl. I think the problem was partly that after years of taking in entertaining, probably dumbed down versions of the stories, the reality ended up a bit of a let down. Another problem was I had trouble liking any of the characters. Achilles? Hector? Even Odysseus? Ugh! Whiney, deceitful, and not very likeable!The Iliad was pretty painful to get through. I forced myself to finish and didn't even get a payoff in the end. What happened to Troy?! Andromache?! Priam?! The Iliad won't tell you! The sacking of Troy is alluded to in the Odyssey with a brief overview of the Trojan Horse and the men hiding in it. That's it! The Odyssey was better than the Iliad, maybe 2 stars. I have a bit of a complex now that I've read the books and not liked them. I consider myself a fairly intelligent person, but I just couldn't connect with these classic works of literature that have been read by, and enjoyed by countless people for centuries. The Iliad and the Odyssey are, of course, must-reads. It's hard to comment on classics like these, but, for those who haven't yet read them: I think the Odyssey is more entertaining than the Iliad because the action continues throughout whereas the Iliad has many breaks in the action to engage in the kind of lists of unpronounceable names you see in some places in the Old Testament of the Bible. Both of them are, however, fantastic. Together these two works attributed to Homer are considered among the oldest surviving works of Western literature, dating to probably the eighth century BCE, and are certainly among the most influential. I can't believe I once found Homer boring. In my defense, I was a callow teen, and having a book assigned in school often tends to perversely make you hate it. But then I had a "Keats conversion experience." Keats famously wrote a poem in tribute to a translation of Homer by Chapman who, Keats wrote, opened to him "realms of gold." My Chapman was Fitzgerald, although on a reread of The Odyssey I tried the Fagles translation and really enjoyed it. Obviously, the translation is key if you're not reading in the original Greek, and I recommend looking at several side by side to see which one best suits.A friend of mine who is a classicist says she prefers The Illiad--that she thinks it the more mature book. The Illiad deals with just a few weeks in the last year of the decade-long Trojan War. As the opening lines state, it deals with how the quarrel between the Greek's great hero Achilles and their leader Agamemnon "caused the Akhaians loss on bitter loss and crowded brave souls into the undergloom." So, essentially, The Illiad is a war story. One close to three thousand years old with a mindset very alien to ours. One where unending glory was seen as a great good over personal survival or family. One where all felt that their ends were fated. And one with curiously human, or at least petty, gods. Some see the work as jingoistic, even pro-war, and I suppose it can be read that way, but what struck me was the compassion with which Homer wrote of both sides. We certainly care for the Trojan Hector as much as or more (in my case much more) than for the sulky and explosive Achilles. For the Trojan King Priam as much or more (in my case much more) than King Agamemnon. Homer certainly doesn't obscure the pity, the waste, and the grief war brings. And there are plenty of scenes in the work that I found unforgettable: The humorous scene where Aphrodite is wounded and driven from the field. The moving scene between Hector and his wife and child. The grief Helen feels in losing a friend. The confrontation between Priam and Achilles.I do love The Illiad, but I'd give The Odyssey a slight edge. Even just reading general Greek mythology, Odysseus was always a favorite, because unlike figures such as Achilles or Heracles he succeeded on his wits, not muscle. It's true, on this reread, especially in contrast to say The Illiad's Hector, I do see Odysseus' dark side. The man is a pirate and at times rash, hot-tempered, even vicious. But I do feel for his pining for home and The Odyssey is filled with such a wealth of incident--the Cyclops, Circe, Scylla and Charybdis, the Sirens--and especially Hades, the forerunner of Dante's Hell. And though my friend is right that the misogynist ancient Greek culture isn't where you go for strong heroines, I love Penelope; described as the "matchless queen of cunning," she's a worthy match for the crafty Odysseus. The series of recognition scenes on Ithaca are especially moving and memorable--I think my favorite and the most poignant being that of Odysseus' dog Argos. Epic poems about 2,700 years old, in the right translation both works can nevertheless speak to me more eloquently than many a contemporary novel. Après avoir tant entendu parler de l'Iliade et de l'Odyssée, j'ai trouvé la lecture de l’œuvre originale (traduite) intéressante. Bien que les nombreuses comparaisons et références aux divinités grecques m'aient fait perdre le fil du texte à certains moments, j'ai pu voir pourquoi cette œuvre a traversé les âges et est considérée comme un chef-d’œuvre. C'est une lecture à faire au moins une fois dans sa vie. I really enjoyed reading Homer's Odyssey and Iliad. I actually read this book of my own volition and not because I had to for school. The stories are very unique and captivating. You'll be sitting on the edge of your chair. I recommend this book to anyone who likes mythology of any kind. I enjoyed it so much that I believe I'll give it another read after so many years and an adequate review. This book is pretty complicated to understand sometimes because of the huge number of characters in it and some divinities we may not know. The vocabulary is epic and we enter a nice story full of "mini stories". It was interesting to read because we can see many comportments which can be good to follow or not. Even this days, reading Homere is quite accurate and contribute to our personal culture. After being force-fed this epic poem in school I was stunned by how much I loved it! I don't even know who's translation I first read, but I've read The Iliad twice since, and Fagles' translation is the best yet. Beautiful imagery and really exciting battle scenes (really!) explaining the loyalties of The Gods and their favorites on Earth. This book is not a chore like we have been led to believe. Trust me, I don't go out seeking ancient Greek poems. But this is great stuff and Fagles' translation led me to buy his Homer's Odyssey to read it for the first time. Simply beautiful! This stuff can get violent so steel yourselves.I was so impressed and moved by his translations I tried to email Dr. Fagles to let him know, only to find out that, sadly, he had passed away a few months earlier.If you have the slightest interest, please do yourselves a favor and dive into his translations of these astounding works of literature.And then...hit the trifecta and do The Aeneid! Finished! Finally done. *I've read it for my Foreign literature class. It took me a month, and not because it was boring or anything (although some chapters were less exciting than others), it's just really hard to read because of the metre - hexameter. Not a natural metre for a Russian poetry, so it was unusual. But I did like this book. Especially all those gruesome descriptions of death. It was sort of fascinating. Also I did like a lot of the characters - Andromache, Achilles, Hector, Patroklos. There was not much of a beginning or an ending to this story, but Homer truly was a genius of epic poems, even though a lot of people agree he was just a generalized character. At the core of Western culture, there is ancient Rome and Greece, and at the core of the ancient Roman and Greek culture, there is Homer. When reading, I really did feel that the Iliad and Odyssey contain the basic building blocks of the Western way of thinking. For example, Achilles and Odysseus were arguing about what to do next, and each could make a case that sounded convincing. But the ideas were not equally good.This translation uses plain English, with no hexameter of rhymes, which helped me focus on the story. The Illiad is very rambling and quite boring. I like the Iliad much better than the Odyssey. THE ILIADThe wrath of Achilles not only begins the oldest piece of Western literature, but is also its premise. The Iliad has been the basis of numerous clichés in literature, but at its root it is a story of a war that for centuries was told orally before being put down by Homer in which the great heroes of Greece fought for honor and glory that the men of Homer’s day could only imagine achieving.The story of the Trojan War is well known and most people who have not read The Iliad assume they know what happens, but in fact at the end of the poem the city of Troy still stands and a wooden horse has not been mentioned. The Iliad tells of several weeks in the last year of the war that revolve around the dishonorable actions of Agamemnon that leads to Achilles refusing to fight with the rest of the Greeks and the disaster it causes in the resulting engagements against the Trojans. But then Achilles allows his friend Patroclus to lead his men into battle to save the Greek ships from being put to the torch only for Patroclus to advance to the walls of Troy and be slain by Hector. The wrath of Achilles turns from Agamemnon to Hector and the Trojans, leading to the death of Troy’s greatest warrior and the poem ending with his funeral.Although the actions of Achilles and Hector take prominence, there are several other notable “storylines” one doesn’t know unless you’ve read epic. First and foremost is Diomedes, the second greatest fighter amongst the Greeks but oftentimes overlooked when it comes to adaptations especially to other important individuals like Odysseus, Menelaus, and the pivotal Patroclus. The second is how much the Olympians and other minor deities are thought to influence the events during this stretch of the war and how both mortals and immortals had to bow to Fate in all circumstances. The third is how ‘nationalistic’ the epic is in the Greek perspective because even though Hector is acknowledged the greatest mortal-born warrior in the war on both sides, as a Trojan he has to have moments of cowardice that none of the Greek heroes are allowed to exhibit and his most famous kill is enabled by Apollo instead of all by himself. And yet, even though Homer writes The Iliad as a triumphant Greek narrative the sections that have Hector’s flaws almost seem hollow as if Homer and his audience both subconsciously know that his epic is not the heroic wrath of Achilles but the tragic death of Hector.The Iliad is the ultimate classic literature and no matter your reading tastes one must read it to have a better appreciation for all of literature as a whole. 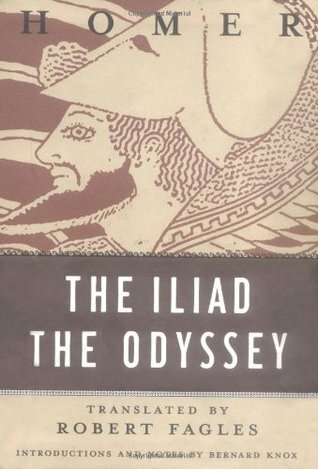 Although the it was first written over 2500 years ago, it shows the duality of heroic feats and complete tragedy that is war.THE ODYSSEYThe crafty hero of The Iliad is in the last leg of his long ten year journey home, but it not only his story that Homer relates to the reader in this sequel to the first war epic in literature. The Odyssey describes the Odysseus’ return to Ithaca after twenty years along with the emergence of his son Telemachus as a new hero while his faithful wife Penelope staves off suitors who are crowding their home and eating their wealth daily.Although the poem is named after his father, Telemachus’ “arc” begins first as the reader learns about the situation on Ithaca around Odysseus’ home and the search he begins for information on his father’s whereabouts. Then we shift to Odysseus on a beach longing to return home when he is informed his long sojourn is about to end and he sets off on a raft and eventually arrives among the Phaeacians, who he relates the previous ten years of his life to before they take him back home. On Ithaca, Odysseus and his son eventually meet and begin planning their revenge on the Penelope’s suitors that results in slaughter and a long-awaited family reunion with Penelope.First and foremost The Odyssey is about coming home, in both Telemachus’ and Odysseus’ arcs there are tales of successful homecomings, unsuccessful homecomings, and homecoming that never happen of heroes from The Iliad. Going hand-in-hand with homecomings is the wanderings of other heroes whose adventures are not as exciting or as long as Odysseus’. Interwoven throughout the poem with homecomings and wanderings is the relationship between guests and hosts along with the difference between good and bad for both that has long reaching consequences. And finally throughout Odysseus’ long journey there are tests everywhere of all types for him to overcome or fail, but the most important are Penelope’s both physical and intimate.Even though it is a sequel, The Odyssey is in complete contrast to The Iliad as instead of epic battle this poem focuses on a hero overcoming everything even the gods to return home. Suddenly the poet who gave readers a first-hand account of war shows his readers the importance of returning from war from the perspective of warriors and their families. Although they are completely different, The Odyssey in fact compliments The Iliad as well as completing it which means if you read one you have to read the other. Historia grega, que já derivou varios livros, vale a pena ler bem sucinta e direta.A cidade de Troia que Homero descreve aqui, todos achavam que era uma lenda até encontrarem ruinas dela na decada de 50. Por isso ainda tem esperança pela cidade de Atlântida já que também a lenda vem de uma história grega. I was forced to read this story through my World Literature class, and I must admit that it wasn't worth the time I spent to read it. I do not like stories such as these, for they are myths passed down for possible 'truths' and can sometimes be believed when they shouldn't be. I had to force myself to finish reading it. Not really sure how to talk about the master-text for all of Western lit. I guess it's just cool to hear the language in it. If we were talking Iliad I might be at a 4 star rating but The Odyssey is just sheer magic. Tell me there's something more sad on an interpersonal level than being away for a long time only to come home and have your dog be the only one to recognize you thru your disguise and then have the dog die? This was so good to go through slowly and thoroughly. I feel like I know more about the world around me. I liked Hector. I like Odysseus. I like Ulysses and I like The Studhorse Man. I like Gross Pointe Blank. I like all these long journeys home. I'm glad I did this. Good change of pace from Star Wars novels and reviewing poetry that the authors get mad about only getting 4/5 stars in ahahha. Epic, beautiful, brutal, and satisfying to the max. Odysseus is the original super hero. Hay libros que uno siempre tiene en mente y que nunca (o casi nunca) lee. La Ilíada y la Odisea los dos grandes poemas de Homero (o de quien sean, pues su autoría no parece confirmada al 100% y parece que pudiera ser una obra mancomunada o bien Homero plasmó por escrito lo que venían siendo cantos dispersos a los que logró dar una unidad inédita hasta entonces) son dos de esos libros que me propuse leer antes de las elecciones municipales y que finalmente he conseguido acabar. Los dos.Ciertos libros tienen mucha fama, incluso demasiada, pero luego no los lee nadie o no tienen tantos lectores como se merecerían. Me juego medio meñique a que estos dos libros de los que hablo han sido leídos en mi país, España, por menos lectores que los que leyeron El código da Vinci, por citar uno.Puestos a comparar diré que me ha gustado nucho más La Odisea (12.110 versos hexámetros), pues me resulta éste mucho más divertido y aventurero que La Ilíada (15.869 versos hexámetros), que lo encuentro más reiterativo, con una estructura más monolítica, la cual se va replicando de canto en canto hasta su final con la entrevista entre Aquiles y Príamo cuyo hijo ha muerto a manos del primero.Así hablo (Príamo) y le infundió (a Aquiles) el deseo de llorar por su padre. Le tocó la mano y retiró con suavidad el anciano. El recuerdo hacía llorar a ambos: el uno a Héctor, matador de hombres, lloraba sin pausa, postrado ante los pies de Aquiles; y Aquiles lloraba por su propio padre y a veces también por Patroclo…Homero, Ilíada 24.507-511La Ilíada no narra toda la guerra de Troya, sino un breve lapso de tiempo que no llega a los dos meses, en el que finalmente muere Héctor al desatar la furia de Aquiles, que renuncia a su inmortalidad para pasar a la posteridad como un mortal de aureola divina (leeros Aquiles en el gineceo de Gomá) y los asediadores logran tomar la ciudad. Uno de ellos es Odiseo o Ulises, quien tras acabar la guerra, siendo él el artífice de introducir el caballo de madera que le dará fama inmortal, decide volver a su casa, en Ítaca.El asedio les ha durado 10 años y en volver a casa desde Troya, le llevará otros diez años, toda una odisea. Una travesía que según leo por ahí se podía haber realizado en unos tres meses sin problemas.Creía que el regreso de Ulises sería un reguero de anécdotas innumerables. Me equivocaba. A Ulises le suceden unas cuantas cosas, sí, pero casi las podemos contar con los dedos de una mano: su huida del cíclope Polifemo, su desoír de las sirenas, su escapada de Circe, su visita al Hades, etc. El libro son 400 páginas y pasada la 200, Ulises llega al hogar y el resto es consumar su venganza que bebe (pero a la inversa) de cualquier producción coreana tipo Old boy (no se hace ascos a la violencia más explícita).Ulises quiere retornar a su casa, reencontrarse con su mujer Penélope, que lo espera después de 20 años, sin flaquear ésta, tejiendo matinalmente y destejiendo con nocturnidad y alevosía un sudario y con su hijo Telémaco, que ve impotente desde su más tierna infancia hasta su adolescencia como los galanes del pueblo van achicando su patrimonio, instalados todos ellos en la casa de su madre diariamente, mientras la pretenden y tratan de convencerla de que se espose con alguno de ellos, convencidos de que Ulises ha muerto allende los mares.A mitad de la novela, Ulises llega al añorado hogar gracias a la diosa Atenea que le echa un cable trasmutándolo bajo el (reversible) aspecto de un viejuno harapiento, hasta que logre poner las cosas en su sitio. Esto es: matar a todos aquellos que se han aprovechado de su hacienda e importunado a su amada en su ausencia. Porque Ulises será facundo en ardides, pero a la hora de manejar la espada, la lanza y el cuchillo no se queda atrás.No es difícil no disfrutar con la poesía inflamada de Homero, con sus epítetos, con su grandilocuencia, con una poética épica casi febril, que merece ser leída en voz alta, recitada, sea uno un aedo o no, porque este texto pide a gritos ser declamado y sobre todo leído.Ahora bien, los más perezosos, a quienes os un hexámetro homérico os asuste casi tanto como a un político hablando de justicia social, podéis comenzar leyendo La Ilíada de Baricco.El 15 de noviembre del pasado año vi y disfrute muchísimo con la particular adaptación teatral que hizo El Brujo de la Odisea. Supuso el acicate definitivo para decidirme a leer finalmente a Homero.Ahora veo el mar y pienso en el ponto vinoso y espero con ansia viva que alguna diosa de blancos brazos derrame sobre mí el regalo del sueño, camino de la piltra. Homer Robert Fagles Bernard Knox - In the Western classical tradition, Homer (Greek: Όμηρος) is considered the author of The Iliad and The Odyssey, and is revered as the greatest of ancient Greek epic poets. These epics lie at the beginning of the Western canon of literature, and have had an enormous influence on the history of literature.When he lived is unknown. Herodotus estimates that Homer lived 400 years before his own time, which would place him at around 850 BCE, while other ancient sources claim that he lived much nearer to the supposed time of the Trojan War, in the early 12th century BCE. Most modern researchers place Homer in the 7th or 8th centuries BCE.The formative influence of the Homeric epics in shaping Greek culture was widely recognized, and Homer was described as the teacher of Greece. Homer's works, which are about fifty percent speeches, provided models in persuasive speaking and writing that were emulated throughout the ancient and medieval Greek worlds. Fragments of Homer account for nearly half of all identifiable Greek literary papyrus finds.